Export BuddyPress xProfile data with User Meta Pro’s users export tool. Activate BuddyPress xProfile Export from User Meta >> Add-ons menu by turning on the respective box’s switch. 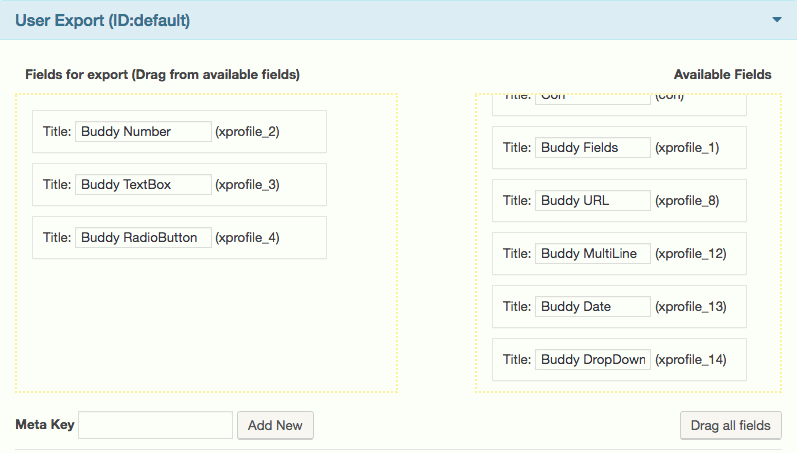 You can find BuddyPress xProfile fields are ready to be exported in User Meta Pro user export tool (go to User Meta >> Export & Import >> User Export). Now treat these BuddyPress fields like any other normal fields for the exportation purpose. Drag fields from Available Fields box to Fields for export box.